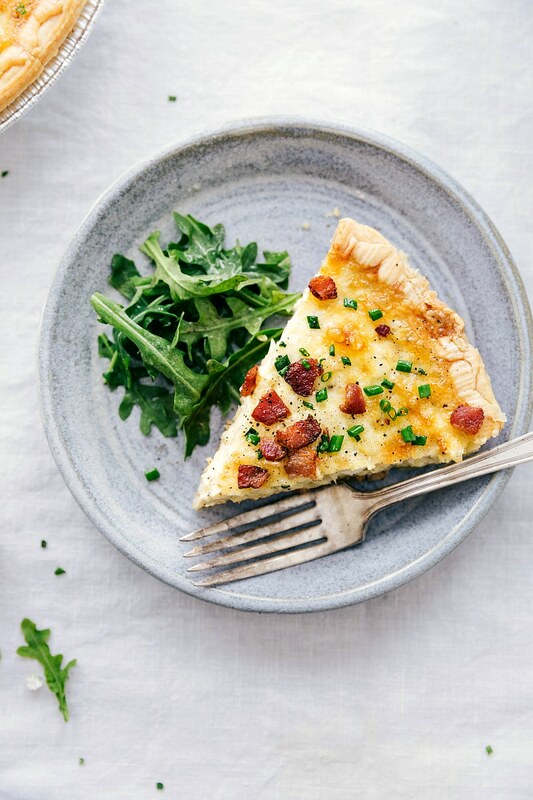 This simple quiche lorraine is packed with flavor! It’s made with onion, bacon, and cheese and with a frozen pie crust to save you time (and energy!) Quiche makes a great addition to your breakfast/brunch spread or can even stand in as an easy lunch or dinner meal. This quiche is quick to make (20 minutes or less of prep time), can be prepped ahead of time, and can be eaten warm or at room temperature. For the ultimate brunch, pair this quiche lorraine with other breakfast favorites such as these homemade pancakes, french toast,or this blueberry coffee cake. The restaurant I used to work at throughout high school and college hosted the most epic Easter and Mother’s Day brunches. As employees, they were one of our favorite days. While they were extremely long days, we’d always get to fill up to-go boxes with leftovers from brunch. And there seemed to always be enough leftovers that we’d have breakfast and desserts for days. Among some of the favorites from the brunch was an amazing bread pudding, perfect deviled eggs, and legendary asparagus salads. One of the dishes we were “known” for were the quiches. Quiche Lorraine to be exact was raved about by all the guests. Quiche lorraine is named after the Lorraine region of France. 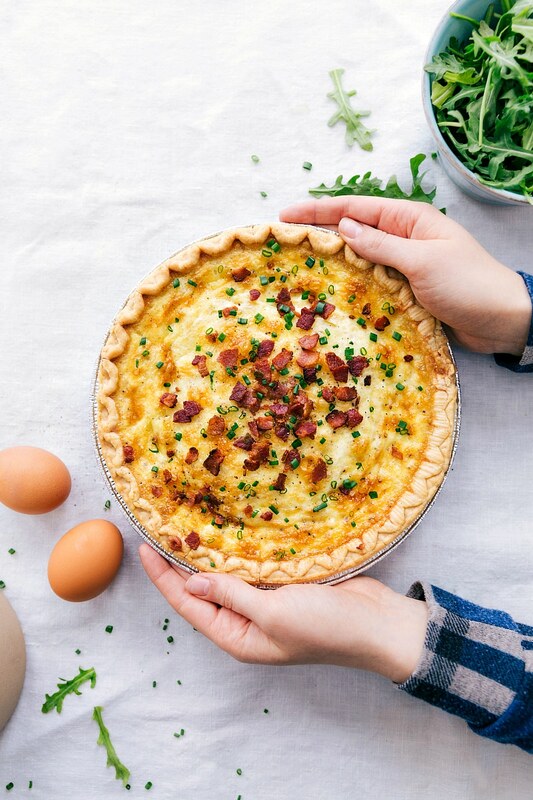 A traditional quiche lorraine is similar to other quiches — it’s a savory custard pie made with only bacon, eggs, and cream. 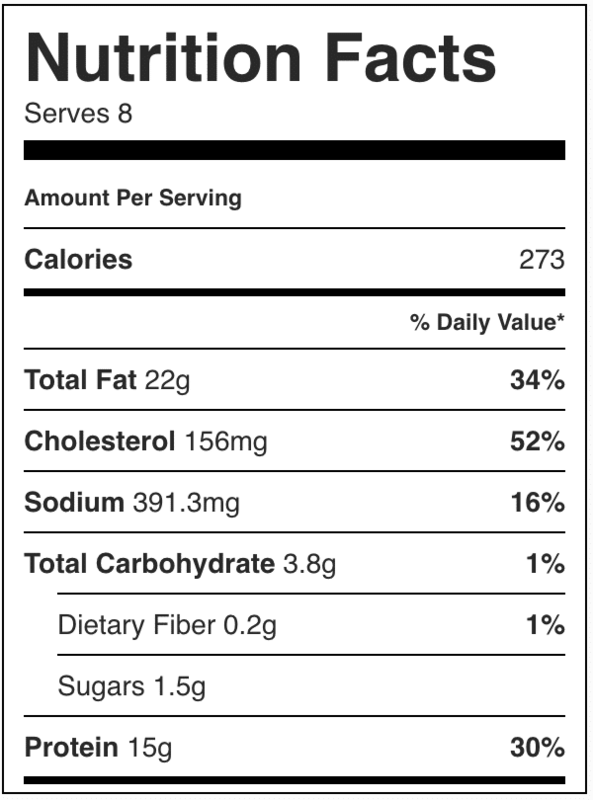 Bacon: we prefer center cut bacon for this recipe. Onion and garlic: yellow onion and minced garlic cooked in bacon fat + butter because it’s the right thing to do. Seasonings: keeping it simple here with just the essentials: salt, pepper, and just a little bit of nutmeg! Nutmeg is the “secret” flavor enhancer to this quiche. Blind bake the crust: don’t skip this step (more on it below). While the crust is baking, you have plenty of time to prepare the filling. Cook the bacon, onion, & garlic: chop the bacon BEFORE cooking and cook up a few extra slices of bacon for a garnish on top. 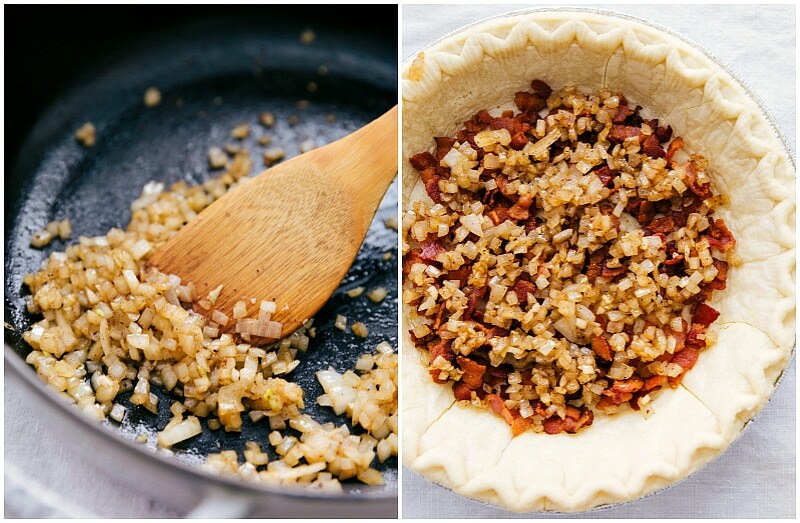 Layer the bacon, onion, and garlic right on top of the crust. Cheese goes on top and the important thing here is to make sure you’ve freshly grated the cheese. 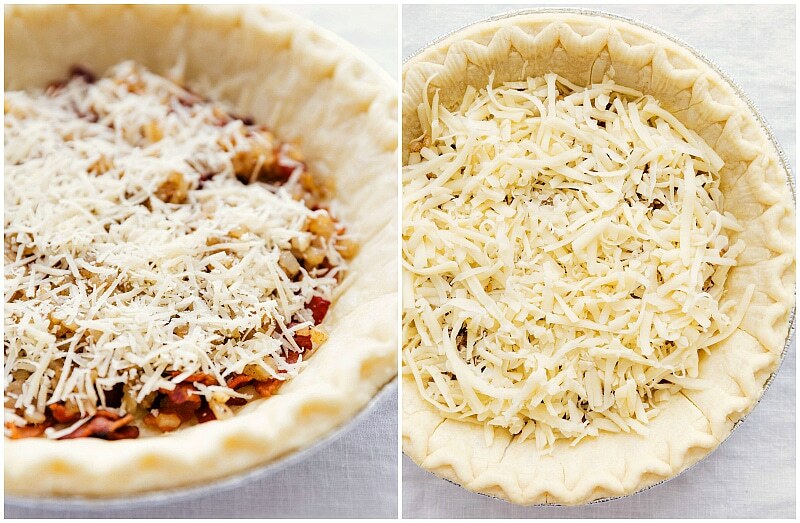 Pre-grated cheese has a cellulose coating to keep it from sticking together and will affect the flavor or your quiche. Bake and garnish: bake the quiche in a preheated oven for 35-45 minutes. Check for doneness at 35 minutes by gently jiggling the quiche. It should still have a little wiggle which fully sets as the quiche cools. If you’ve ever had a quiche with a “soggy” crust it’s likely because it wasn’t blind baked first. Blind baking is the process of baking a pie crust (or pastry crust) first WITHOUT the filling. It’s necessary to blind bake the crust when it’s going to be filled with an unbaked filling. We blind bake to make sure the crust gets baked all the way through AND to prevent the bottom of the crust from getting soggy. If you make a homemade crust, you’ll need to use pie weights, but when using a frozen pre-made pie crust, it’s fine to bake without the weights. What is the difference between a quiche and a frittata? A quiche is an unsweetened custard pie with savory fillings, eggs, milk or cream cheese, and vegetables and/or meat. Quiches usually have crusts, but they don’t have to (in fact you can make this recipe without the crust if desired). It greatly depends on the recipe. 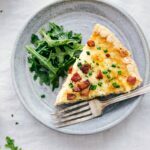 I would not consider this quiche lorraine to be a healthy recipe, but in moderation it’s a delicious addition to a meal. To keep quiche on the healthier side, you can nix the crust OR make a homemade crust. Here are some more ideas to making quiche healthier. Yes, I do this often! PREPARE quiche ahead of time: prepare the bacon & onion mixture and store it in a container in the fridge. Pre-grate the cheeses and store those in a separate container. Lastly, whisk up the egg & cream mixture and again store in an airtight separate container. When ready to serve, simply assemble everything in the par-baked crust and bake. Transfer baked quiche to a wire rack to cool completely. Cover and store in the fridge until ready to eat. To reheat, cover quiche with foil and bake in a 325 degree F oven for about 10-15 minutes. While you can bake and store quiche ahead of time, we always prefer it made fresh so I would recommend preparing the components ahead of time and then assembling and baking right before enjoying. Freezer: you can store a pre-baked quiche (properly wrapped in airtight container/bags) for 1 to 2 months. Thaw overnight in the fridge. Freezing does make the quiche lose texture and become a bit watery. This simple quiche lorraine is packed with flavor! It's made with onion, bacon, and cheese and with a frozen pie crust to save you time (and energy!) Quiche makes a great addition to your breakfast/brunch spread or can even stand in as an easy lunch or dinner meal. Preheat oven to 400 degrees F. Place unwrapped frozen pie crust on a baking sheet and bake for 10 minutes. Remove and allow to slightly cool. (Keep crust on the baking sheet) Reduce the oven temperature to 350 degrees F.
Meanwhile, cut bacon strips into small strips/pieces. Add bacon to a large skillet over medium high heat. Cook until bacon is golden and then remove to a paper towel lined plate and allow to slightly cool. Remove 2 tablespoons of the bacon to reserve as a garnish for the top. Drain off all the fat but 1 tablespoon of bacon fat. Add 1 tablespoon butter. Add the diced onion and cook until soft and translucent, about 5 minutes. Add in the garlic and stir for another 30 seconds to a minute. Remove right on top of the cooked bacon to drain and allow to slightly cool. Place the bacon and onion/garlic mixture right on top of the par baked crust. Sprinkle parmesan cheese evenly on top. Sprinkle swiss cheese evenly on top. 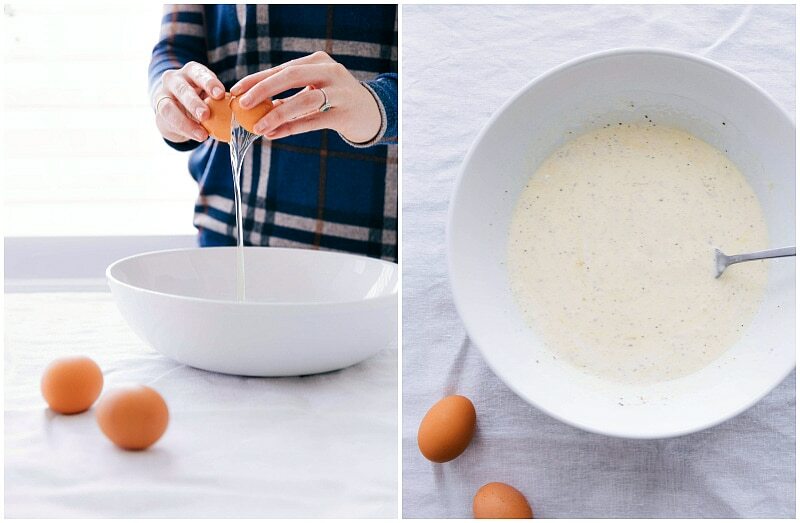 In a large bowl, whisk the eggs until lightly beaten. Then whisk in the cream, nutmeg, and salt & pepper (to taste; I add 3/4 teaspoon salt and 1/4 teaspoon freshly cracked pepper). Whisk until smooth. 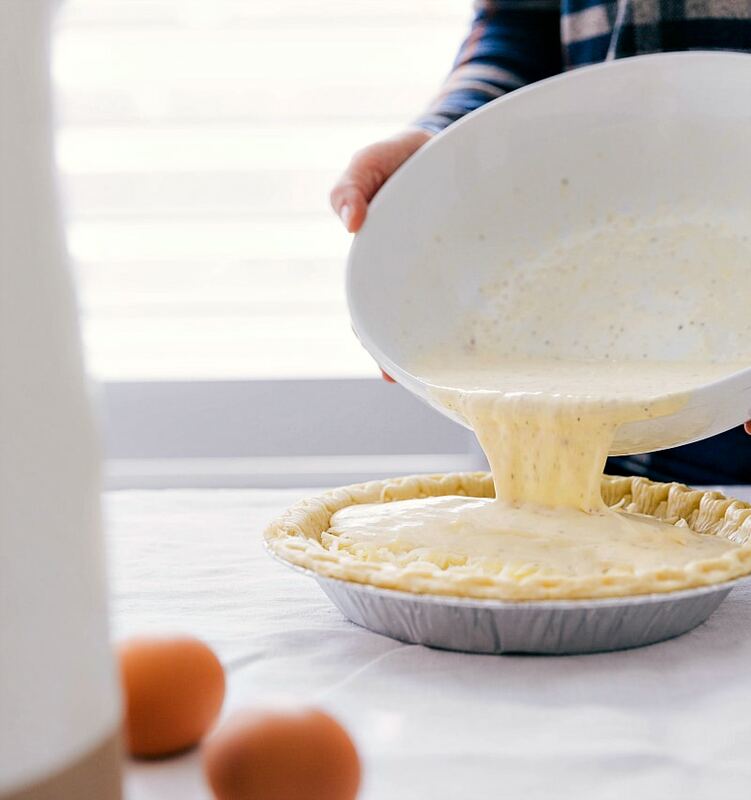 Pour cream/egg mixture into the par-baked pie crust (still on the baking sheet) and bake on the middle or lower oven rack (not the top one) for 35 to 45 minutes, or until quiche is set and very slightly jiggly in the center. (It will finish firming up outside of the oven). Avoid overbaking the quiche -- if there is a slight jiggle, it's done. Serve warm with reserved bacon and fresh chopped chives.